Grassform provides pedestrian focused products to keep your people out of the mud, safe and on their feet whatever the weather. If its a temporary footpath in a school to divert the school population during some building works or perhaps a marque for a wedding or party event, prom or anniversary we can provide a solution to fit your requirement. We hire we sell and we install all of our temporary event pedestrian flooring products with our own direct workforce so you can relax. If you need further advice please call our experienced sales staff who will be happy to assist or you can go on line via our enquiry webpage. Indoors and outdoors, temporary pedestrian surfaces are in high demand for a range of different purposes. From creating temporary pedestrian walkways at festivals, shows and summer fairs, to providing marquee flooring for weddings, proms and parties, easy-to-install, cost-effective solutions are an essential consideration at events of all shapes and sizes. Temporary flooring is also often a key consideration in health and safety. For example, when construction projects take place at schools, college campus or business park, it is often necessary to create temporary footpaths to divert pedestrians away from the work. Grassform supplies high quality, flexible pedestrian-focused products to keep people out of the mud, on their feet and safe whatever the weather. Lightweight yet durable, our plastic flooring tiles are easy to handle and straightforward to put together, with an interlocking design meaning they can cover any size or shape of surface. They provide solid, stable ground reinforcement for pedestrian traffic on wet and boggy ground, while also allowing for natural surface drainage. As with the majority of our products, we sell temporary flooring manufactured from recycled plastic, ensuring our solutions are sustainable and environmentally friendly. Grassform hires and sells pedestrian flooring products, and we also provide a full delivery and installation service via our experienced professional team. So all you have to do is tell us the surface area you need to cover, give us the designs, and then you can relax while we take care of the rest. Similarly, we also offer friendly, honest advice on quantities, designs and the best products to suit your purposes. We treat every client as unique, and will always work to put together a bespoke solution to suit your unique purposes. 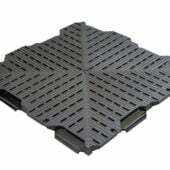 For outdoor and indoor temporary pedestrian flooring, we supply Diamond Track modular tiles. A high quality portable flooring solution, Diamond Track is ideal for providing a stable, solid walking surface in all conditions while protecting grassy surfaces from wear and tear from high footfall. Diamond Track is made from tough recycled polypropylene. A lightweight material with a relatively high tensile strength, it means that Diamond Track tiles are extremely easy to transport, handle and install, meaning you can get your temporary pedestrian walkways or marquee flooring set up in double quick time. Yet despite being so lightweight, Diamond Track is more than capable of withstanding moderate to high pedestrian traffic, and is also suitable for bicycles. One of the main advantages of Diamond Track is the degree of flexibility it offers for installation. Individual tiles lock together easily and quickly, and can be laid down in a uniform ‘square’ pattern with each tile directly adjacent to the next. The seamless joints and attractive ‘diamond’ design this creates ensures Diamond Track provides an aesthetically pleasing as well practical solution. Diamond Track tiles can also be installed using a technique known as ‘brick bonding’. This involves having different rows of tiles offset against those above and below in a diagonal pattern, the way you see on a brick wall. As is the case with masonry, the reason for using this arrangement is to provide additional strength. It is therefore recommended for high traffic, high impact uses – perfect, for example, for a busy temporary dance floor at an outdoor concert. Diamond Track is ideal for virtually any kind of temporary pedestrian flooring. It is not, however, suitable for vehicles, as it does not have the strength to bear heavier loads. For surfaces to be used by vehicles, we recommend our range of ground reinforcement boards or grids. Diamond Track can be used on a wide variety of outdoor terrains, including lawns, fields, uncovered soil and woodland areas. Because of the good drainage it provides, it is particularly well suited to wet and boggy conditions, and used on grassed areas will both help prevent excessive damage to the ground and provide a stable, non-slip surface for pedestrians. It is commonly used to create temporary pedestrian walkways for a wide range of events and occasions. For fairs, fetes, festivals and school and sports club open days, Diamond Track can be used to create reliable paths across fields and other grassed areas. For concerts and sporting events, it can also be deployed to make standing areas or temporary dance floors on top of a grass surface. Its versatility means Diamond Track is just as useful indoors as it is out. Many customers choose Diamond Track to create marquee flooring for weddings, parties, beer festivals and community celebrations, because it is so quick and easy to install and then take out again. We have also had orders for Diamond Track to create portable flooring for school gyms, allowing schools to maximise space and resources by using a hall for multiple purposes. Similarly, it also makes a great temporary surface for playgrounds, ideal if you want to create a children’s play area at an event. If you need further advice, please call our experienced sales staff who will be happy to assist, or you can submit an online enquiry here.